You are here: Home / Frequently Asked Questions / Do I Always need a Lawyer? Do I Always need a Lawyer? Often I receive calls from prospective clients who want to know at what point should they hire an attorney or if they even need to hire a lawyer at all. Many are under the impression that upon becoming injured on the job, they will automatically begin receiving workers’ compensation benefits. Very rarely, however, does an injured worker receive all benefits and proper medical care without objections and complications from the insurance companies in the increasingly adversarial workers’ compensation system. Because insurance companies are in the risk management business, their primary priority is to pay out as little as possible and close cases as quickly as they can. Every weekly benefit check issued and every doctor bill paid detracts from their bottom line profit. In other words, a claimant’s health, right to fair medical care, and overall well being do not factor into the insurance company’s handling of workers’ compensation claims. In fact, your employer and its insurer will use every technique and strategy available to minimize their obligations to you. Thus, if you sustained a a life altering or permanently damaging work injury, I strongly encourage you to hire an attorney. The primary purpose of a workers’ compensation lawyer is to serve as your biggest advocate. 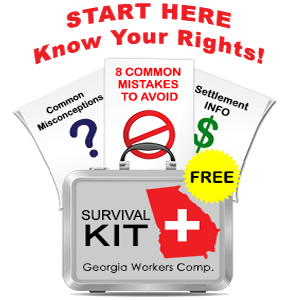 Unless you have somebody on your side, pushing back and asking for proper care and an appropriate settlement for workers’ compensation in the state of Georgia, you are not going to get it. how do you calculate how much is your case worth? how much does the insurance company think your case is worth? should we settle and if so, when is the right time to settle? what is a Medicare set aside and how can it be negotiated? How will you proceed once your case is settled? These represent just some of the questions for which I provide legal counsel for my clients. Due to the adversarial nature of workers’ compensation cases, the complexity of the law, and the necessity of having experienced legal council advocate on your behalf, I encourage you to contact me as soon as possible after your injury. You may decide that you case is not serious enough to involve a lawyer or to file a claim but at a minimum you will know your options. Please fill out the workers’ compensation evaluation form or feel free to call me directly at 770-351-0801.